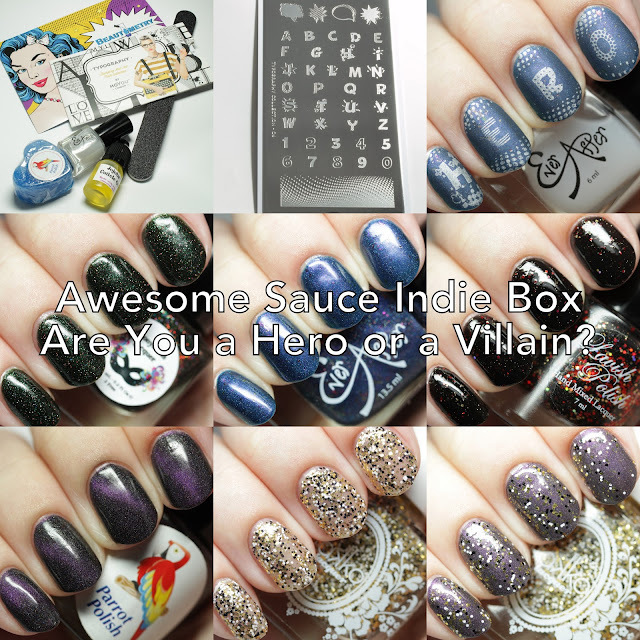 The Awesome Sauce Indie Box has just launched again with the Are You a Hero or a Villain? theme! This box contains polishes from Anonymous Lacquer, Ever After Polish, Lavish Polish, Parrot Polish, and Takko Lacquer, as well as a MoYou London stamping plate from Beautometry, and extras from Anonymous Polish, Ever After Polish, and Parrot Polish. Let's have a look! 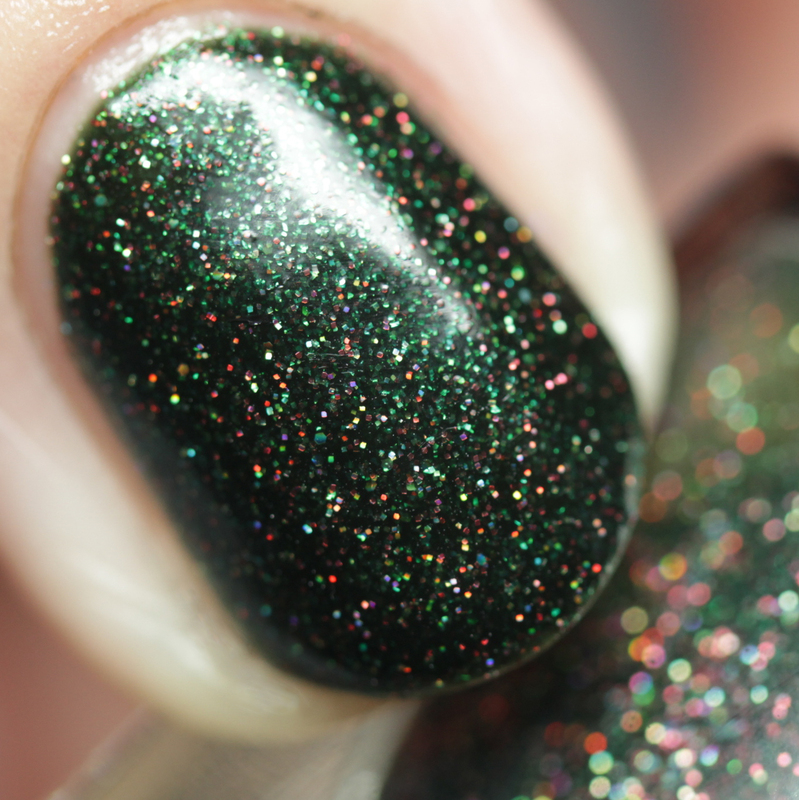 Anonymous Lacquer Ms. Ivy League is a dark forest green jelly with gold and red holo microglitter. 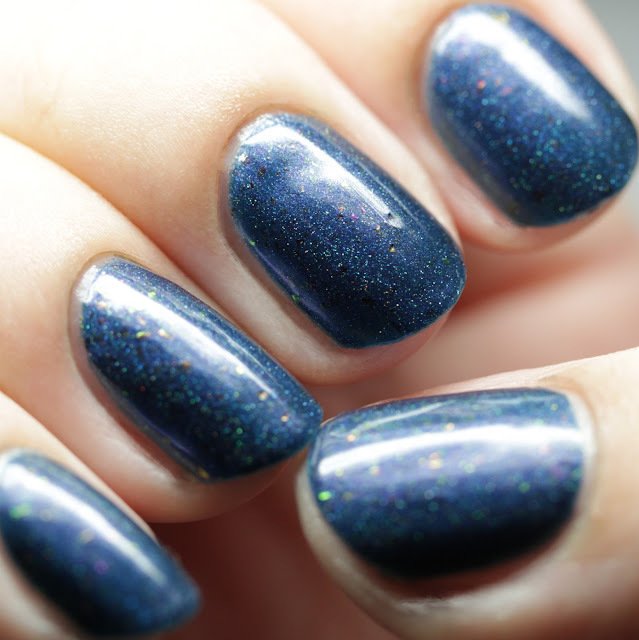 This stunner is super-sparkly, and is shown here with three thin coats (two are enough) and a single layer of top coat. It dries quickly and fairly smoothly. 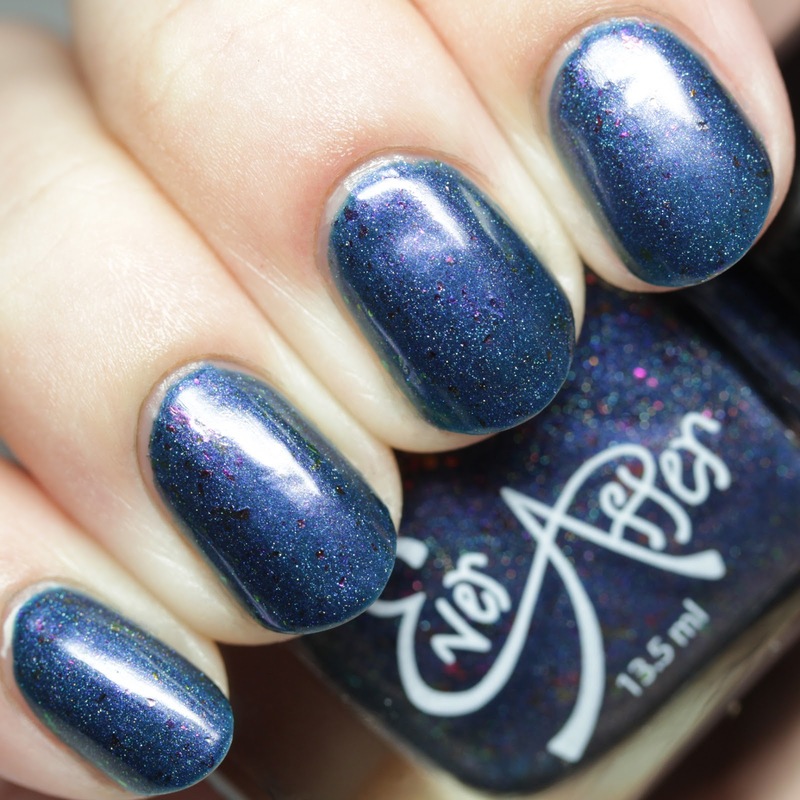 Ever After Polish Raven is an iron blue with pink shimmer, scattered holo, and magenta-to-green multichrome flakes. Great formula, it covers in two or three thin coats and dries quickly. 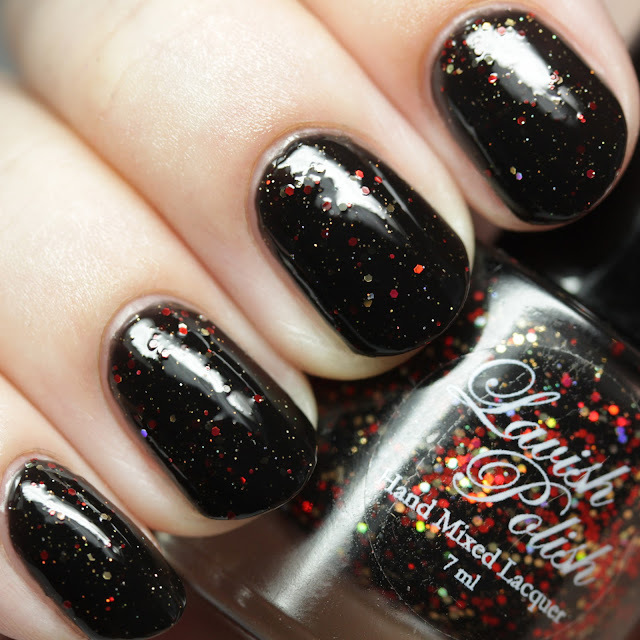 Lavish Polish Daddy's Little Monster has gold and red holo glitter in a black base. 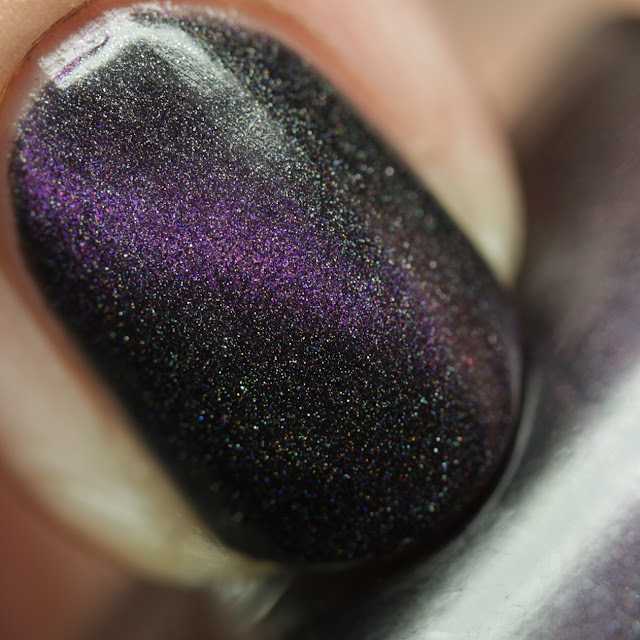 This covers well in two thin coats and the black base is shiny even without top coat. 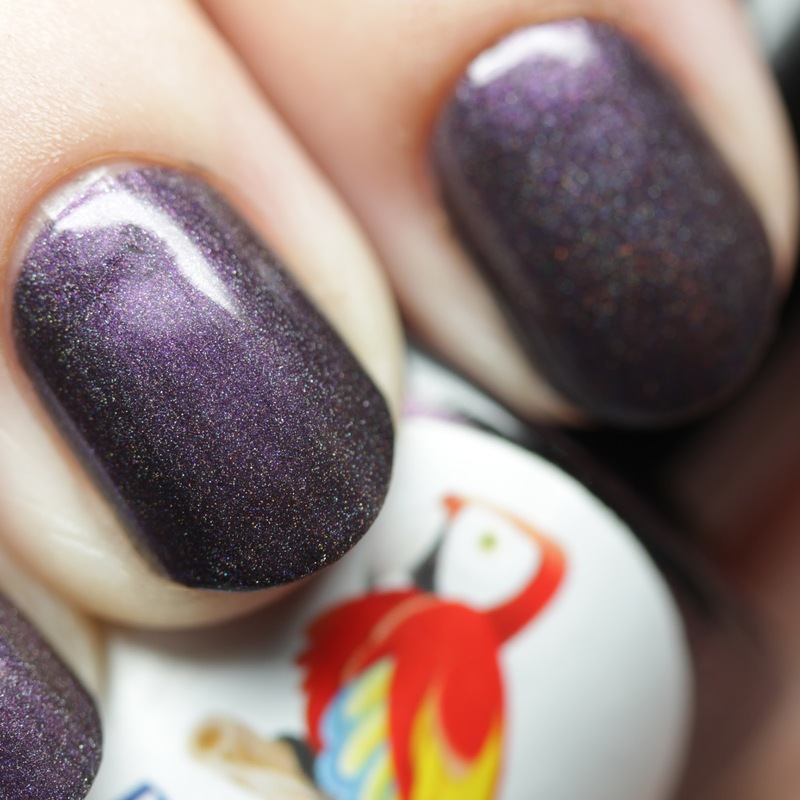 Though the base is opaque, it doesn't cover the glitters at all, which is really amazing! 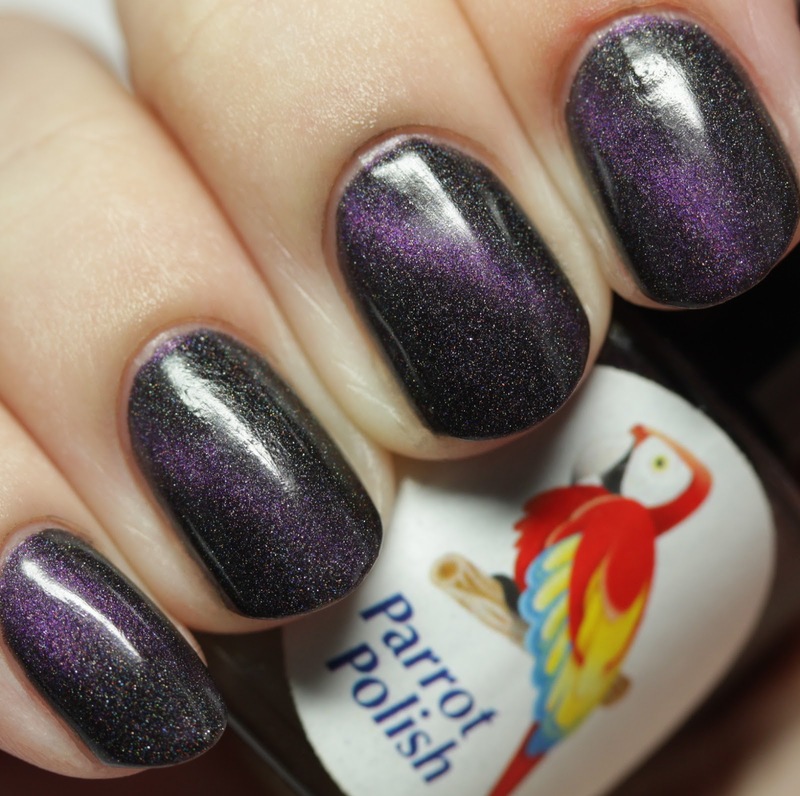 Parrot Polish Magneto is a black/Chinese violet magnetic polish with scattered holo, opaque in two thin coats. It dries very quickly, which means it is best to do one nail at a time on the second coat and apply the magnet immediately. I used a strong bar magnet purchased off ebay. 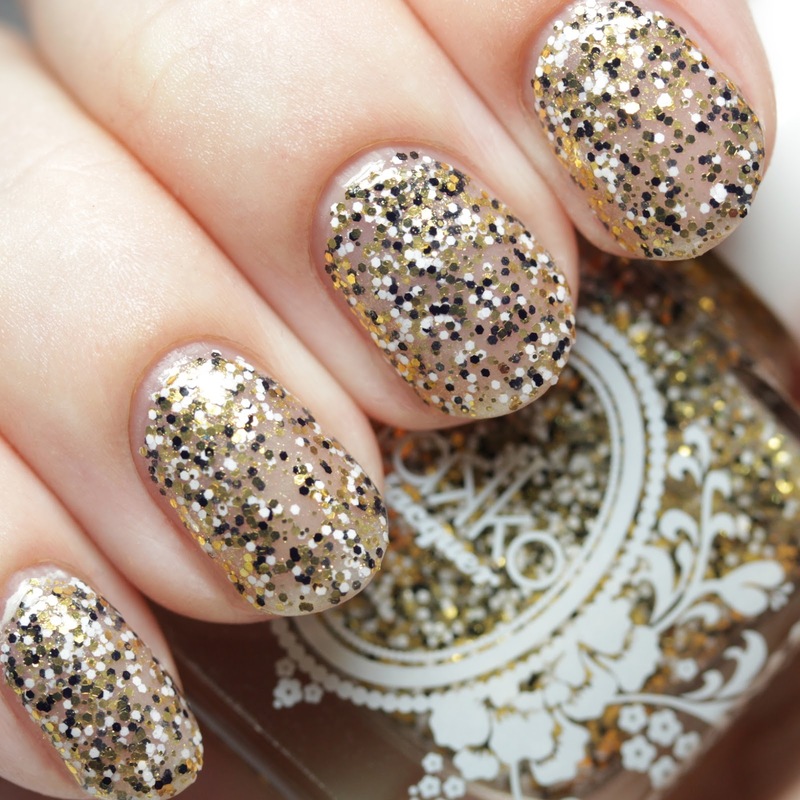 You can also give it another touch up with the magnet once you apply top coat. 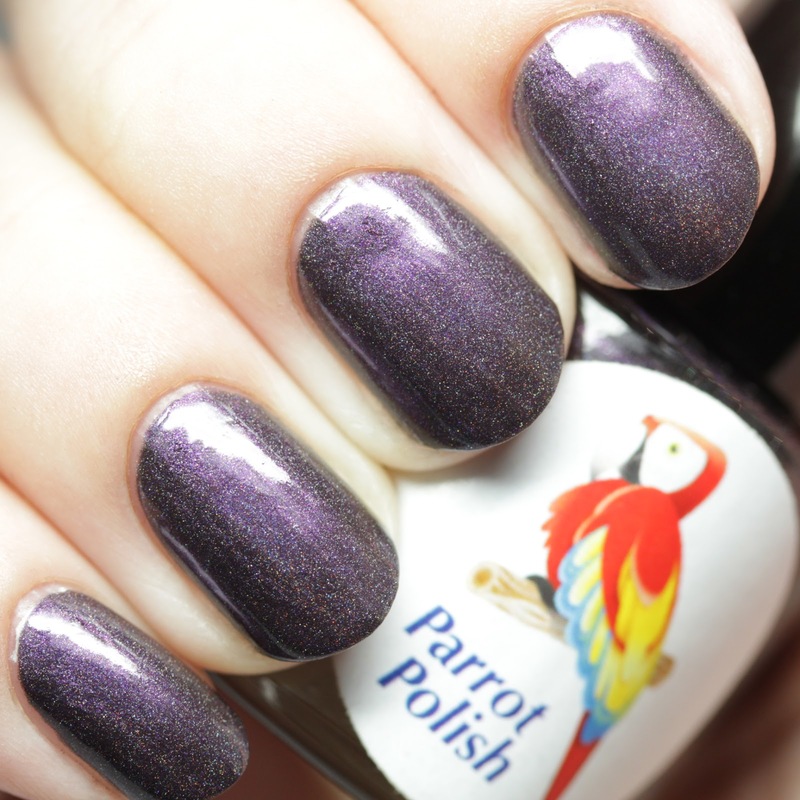 Worn without magnetization, Parrot Polish Magneto is a muted Chinese violet scattered holo shimmer. 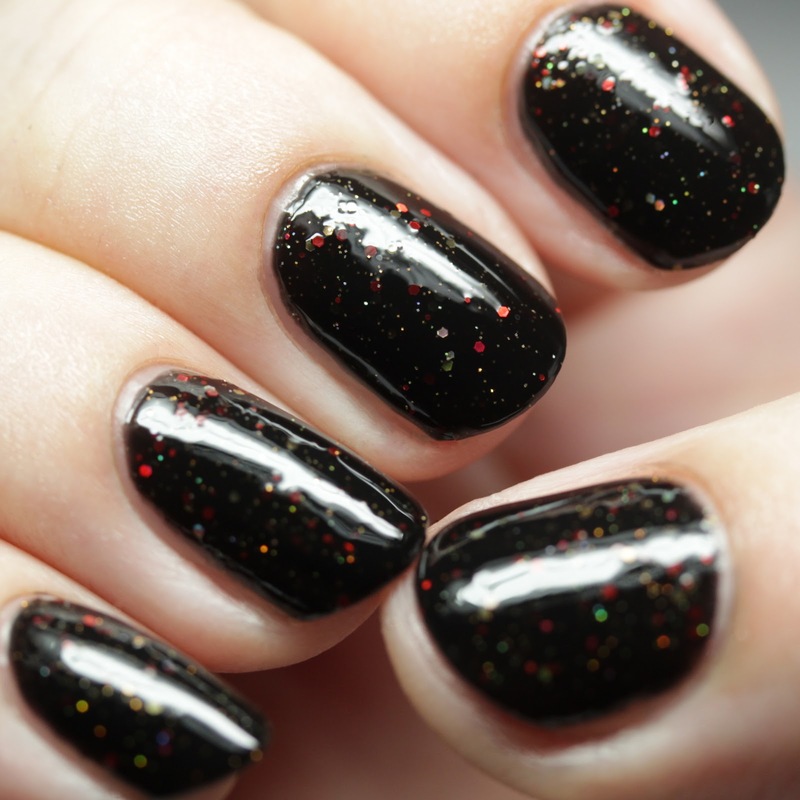 Takko Lacquer Cruella has white and black matte glitters and gold microflakes in a clear base. 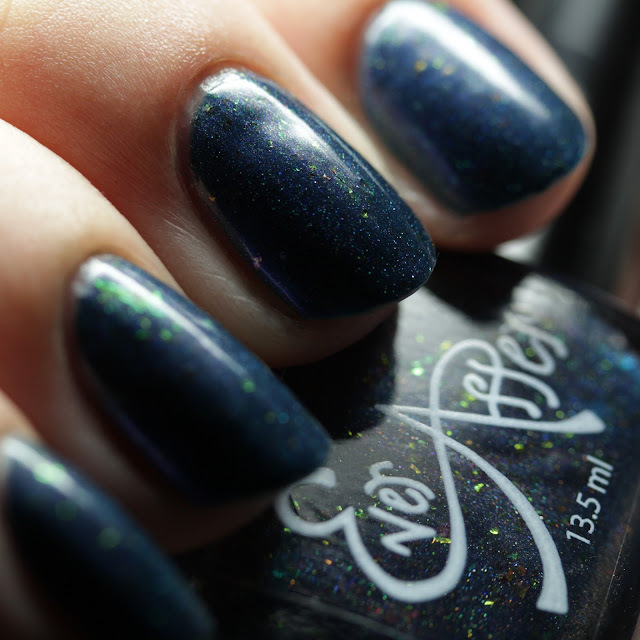 I wore it on its own in four thin coats and top coat for a neat, graphic effect. 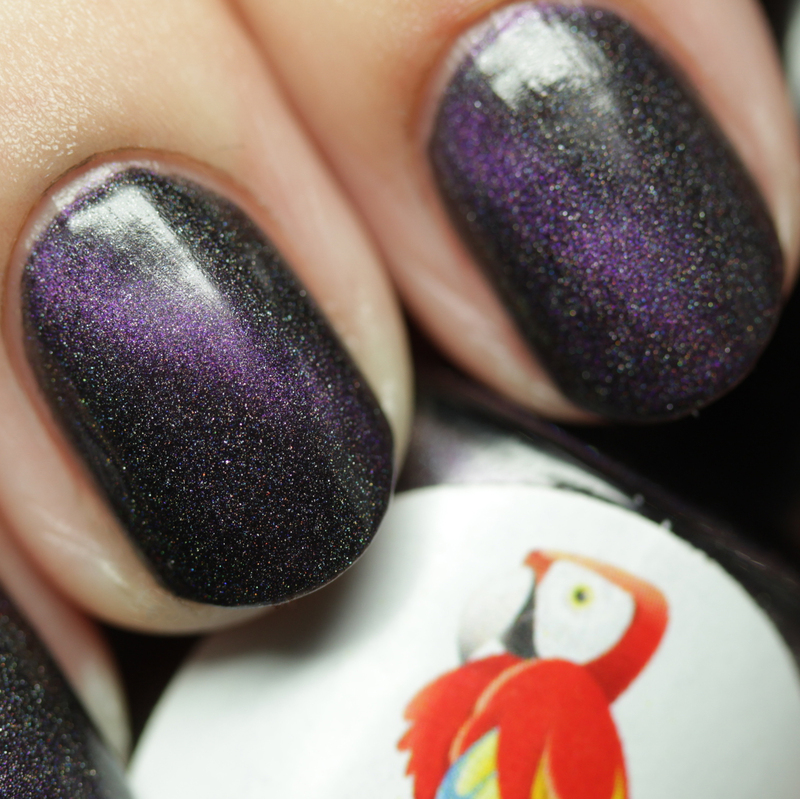 I also tried one coat over Parrot Polish Magneto (unmagnetized) to show it as a topper. This month you will also receive and lightly fruity Jojoba Cuticle Oil from Anonymous Lacquer, a Moyou London stamping plate in one of four designs and nail file from Beautometry, an online indie nail polish and supply retailer, a matte top coat from Ever After Polish, and an unscented glycerin soap from Parrot Polish. 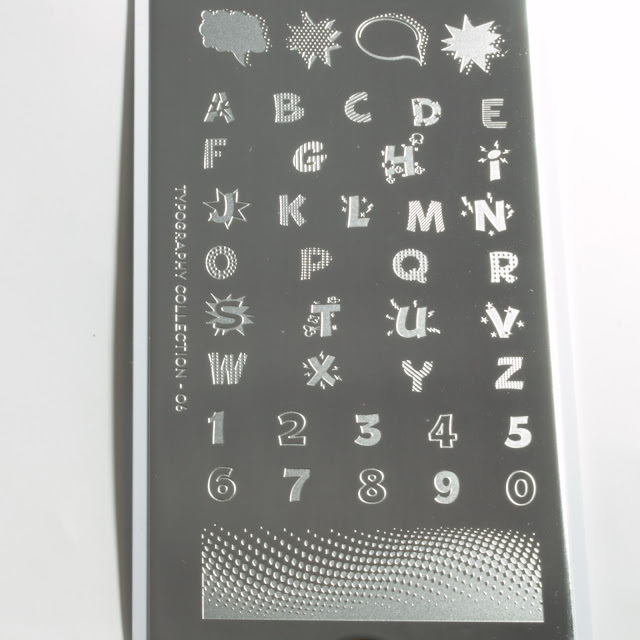 The plate I received was the MoYou London Typography Collection 06, which features letters and numbers as well as a few border options. 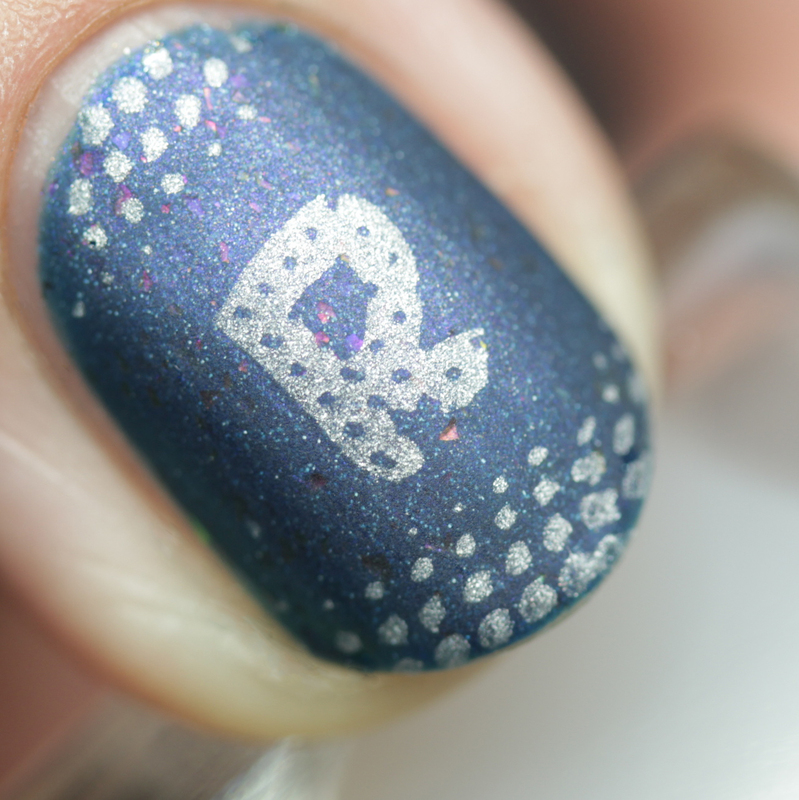 I chose to stamp using Emily de Molly Silver Holographic Stamping Polish over Ever After Polish Raven using my Born Pretty Store Clear Jelly Stamper, then finishing off with the Ever After Polish Matte Top Coat. The stamping picked up as easy as can be! MoYou London's quality is pretty much fail safe and the etching is nice and deep. The matte top coat worked really nicely and evenly. The Awesome Sauce Indie Box Are You a Hero or a Villain? is available now for $35 for mini size and $55 for full size. 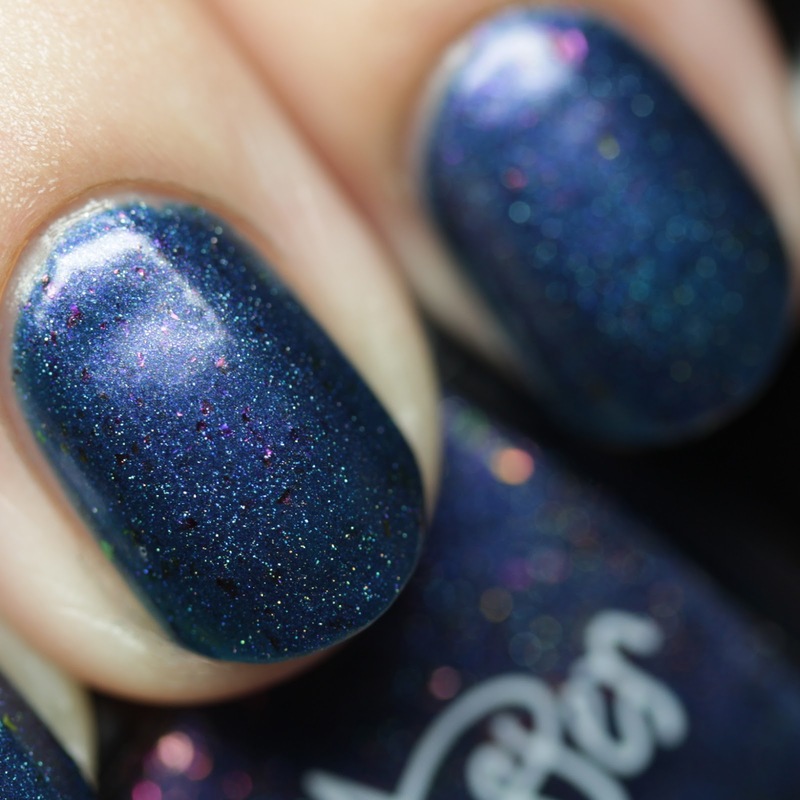 In this post, I am showing minis in the Anonymous Lacquer, Ever After Polish matte top coat, Lavish Polish, and Parrot Polish and full sizes in the Ever After Polish and Takko Lacquer. As always, this box is a fantastic deal - you are getting a lot more than you would for standard retail price! Hope you enjoyed it and be sure to head over to pick it up this week if you are interested!